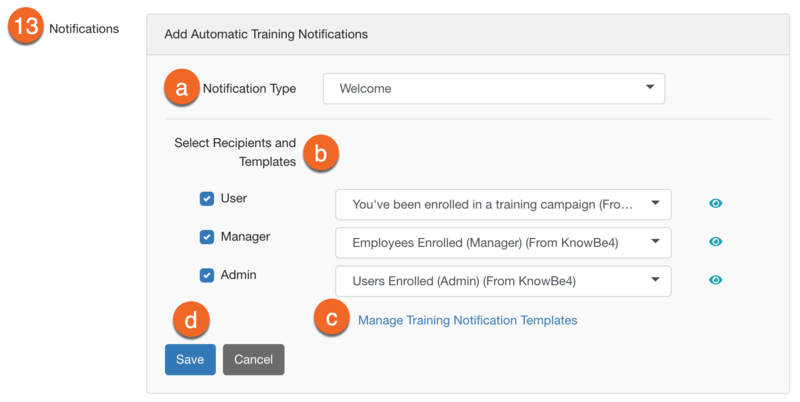 The Training section of your console is where you can enroll users in training and policy acknowledgment campaigns, manage your ModStore purchases and custom content, create or edit training notification templates, and view reports on user activity and progress within the training environment. As part of your security awareness training plan and before you set up training campaigns, you'll want to decide how to set up your Learner Experience (LX). For example, if you want to use KnowBe4's optional gamification (including badges and leaderboards) you'll need to enable these features in your Account Settings area. You'll also want to brand your LX with a custom color and add a company logo in your Account Settings to provide a familiar feeling to your end users when they log in for training. Read this article, or watch our training-related videos on our Tutorial Videos page, to learn about the various functions of the Training area. 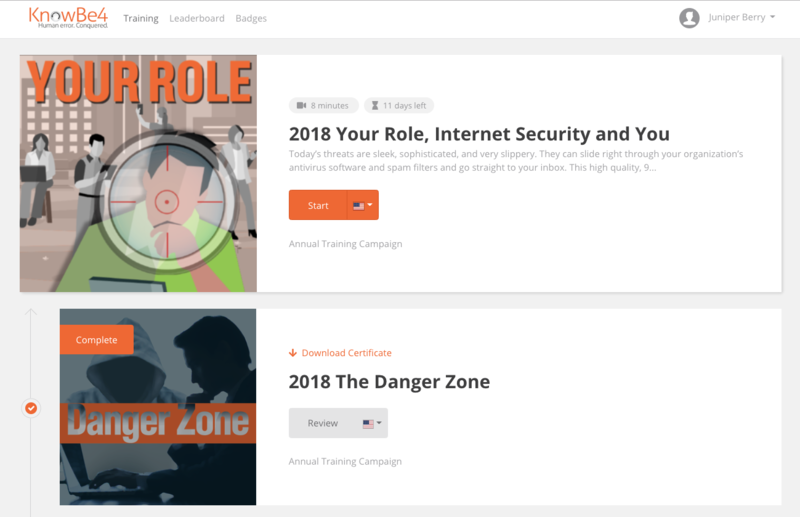 Our platform uses a training campaign system to help you manage your organization's security awareness (or other) training, as well as policy distribution and acknowledgment tracking. You can use campaigns to automatically enroll your users in training assignments and/or mandatory policy acknowledgments. You'll be able to set up automatic reminder notifications to ensure users complete the assigned content before the deadline. These notifications are fully customizable. 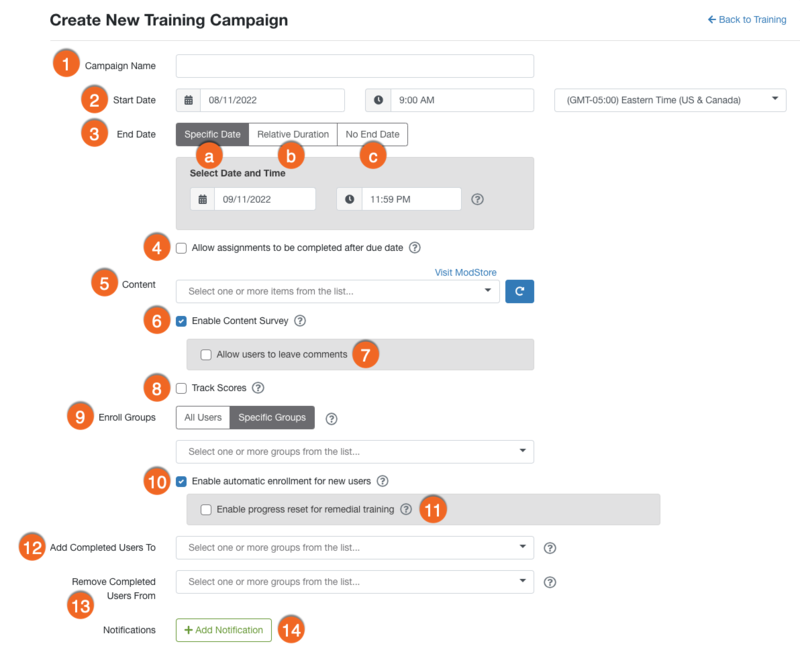 The Campaigns tab is where you can view, edit, or create training campaigns. Here, you will see a list of all your current and past training campaigns, their status, and progress at a glance. First, name your campaign. This can help you keep track of the purpose or scope of the campaign. Note that enrolled users will be able to see the title of your training campaign on their training page and also in system notifications (such as the welcome email or reminder notifications). Set your campaign's start time here. You can set it to start in the future if you wish. This is helpful if you plan on having a campaign run in the future and want to set it up in advance. You can select a specific time zone for the campaign if needed. The time zone will default to your account specific time zone, which you can change in your Account Settings. You have three options for your campaign's end date. You can set a specific end date using the a) Specify Date setting. This will be a hard deadline for your users to complete the assigned training, or acknowledge the assigned policy, no matter when they are enrolled. The second option is to set a b) Relative Duration end date. We recommend using this option for most training campaigns, as it will give a deadline based on when users are enrolled. You'll have the (optional) ability to send out automated reminder notifications based on the specified duration. We recommend having a deadline, as it gives users an incentive to complete their assignments. The final option, c) No End Date, is perfect for additional, optional training you'd like to provide users, so they can take training on their own schedule without an urgent deadline. This will leave the training campaign open indefinitely. Later on, you can alter the end date or cancel the campaign if you need to. A note about end dates and reminder emails: If you've specified an end date, that date is used by the Remind Before Due Date notification type (see below) to determine when to remind a user who has not completed their training. If you change the specific end date after a campaign starts, it will cause the campaign to send additional reminders. For example, if you are on the last day of the campaign and extend the end date by another two weeks, it can result in another set of reminder emails being sent out before the new end date. This is the intended behavior. Check this option if you want to allow your users to access and complete their assignments after the due date. When enabled for a campaign, a clock icon is displayed next to the campaign dates to indicate that users are allowed to complete their training after the deadline (click to view). The console offers several options for allowing users to complete training when they've missed their deadline, learn more here. The Content drop-down is where you'll select the assignments that your users will be enrolled in as part of this campaign. Choose the modules or games you'd like users to complete and/or what policies you'd like them to acknowledge. Remember, ModStore items must be added to your Store Purchases before you can use them in training campaigns. In this drop-down menu, you can sort content by Title, Duration, and Published date. After selecting what you'd like to enroll users in, you can optionally prioritize this content (a) by dragging and dropping them in the order you'd like users to see when they log in for training. Retired modules will not show up in your Content drop-down by default. If you'd like to use training content that is retired or nearing retirement, select the Include Retired Courses checkbox in the Content drop-down menu. You cannot add additional training content or policies to a campaign once the campaign starts, so you want to ensure that you've included all the necessary content before saving. The Enroll Groups drop-down lets you choose whether you'd like to limit the scope of this campaign to specific groups or enroll all of your users in this training. If this checkbox is selected, new users will be automatically enrolled when they're added to the console if All Users is selected or if they belong to one of the groups that are enrolled in this training campaign. If you have a campaign which includes All Users and check this option "on", if you add new employees or members of your organization to the console while the training campaign is still active, they will be automatically enrolled in the campaign and will receive any scheduled reminder notifications–without you having to manually add them to the campaign. If you have this option off, those users will not be added automatically. If you limited the campaign to one or more groups of users and check this option "on", when new users are added to those groups, they will be automatically enrolled in the training. You can edit this option after a campaign is created. This setting should only be used when creating remedial training campaigns. Once users are re-enrolled in a training campaign which has this setting on, they will have to take the training again. For example, if they fail a phishing test an additional time, and are re-added to a Clickers group which has a training campaign assigned to them, they will be enrolled in the campaign a second time. For information about setting up remedial training, click here. Once users complete their assignments, they will be added to the selected group. See potential use cases for this feature here. Once users complete their assignments, they will be removed from the selected group. See potential use cases for this feature here. You have the option to send automatic notifications to users, user's managers, and the admins on your account. There is no limit to the number of training notifications you can send. Click the +Add Notification button, then see below for details about automatic notifications. (a.) The notification type indicates when the notification will be sent out. Welcome: The first notification type will send a welcome notification to all users when the campaign starts (or at the time they are added to an existing campaign). This notification will inform the user they've been enrolled in training and provide a link to log in to take the training. If your campaign is set to start after the business hours indicated in your Account Settings, the welcome email will be sent at the start of business hours the next day. Remind After Enrollment: This notification type will send a reminder to the selected recipients at the start of business hours a specified number of days after the user is enrolled in training. You can optionally repeat the notification on a specified schedule until users have completed their training. Remind Before Due Date: This notification type will send a notification to the selected recipients at the start of business hours a specific number of days before the user's due date. A value of "0" will cause the notification to be sent on the due date. Campaign Completion: This notification will be sent immediately upon campaign completion to the recipients selected. This is a great way to thank users for taking the training or even let them know that your organization will be sending out simulated phishing emails and other forms of social engineering to test out the skills they learned as part of training. Be advised that if you elect to notify a user's manager or your account admins upon completion that they will most likely receive a single email for each user upon completion. Past Due: This category of notifications is available when you allow content to be completed after it's due (see here for more info about "past due" training). This notification will be sent out to the selected recipients at the start of business hours a specified number of days after the user's due date has passed. You can choose to repeat the notification every specified number of days until the user completes their training assignments. (b.) Notify Recipients indicates who the notification will be sent to. User: Welcome notifications to the user can provide the user instructions to log in, let them know the importance and necessity of taking the training, or even explain your organization's plan for security awareness if you'd like. Reminder notifications can help encourage a user to complete their training in a timely manner. Past Due notifications let the user know they have missed their deadline and encourage them to complete their training as soon as possible. User's Manager: Notifying a user's manager if their employee doesn't complete assigned training on the required timeline can be helpful if the user needs more encouragement to complete the training. Before using this feature, make sure you have properly-formatted and correct manager emails in your user's information. Account Admins: Notifying account admins of user status on the campaign can help them stay on top of the training campaign's progress. High training campaign completion rates will help you to build a strong human firewall for your organization. Note that anyone who is an admin on your account will be notified when using this feature. You can add additional notifications after a campaign has started by editing the campaign. Although existing notifications can be modified after the campaign has begun, we strongly recommend using our manual training notifications for most situations, as notifications will not work retroactively. See here for more information on training campaign notifications. Note, if you're using Password-less Logins for your training, be sure to select the training notifications tagged with "(Password-less)", or create your own using the Password-less logins placeholder. We include several default email templates for you to customize or use as-is. You can also create your own notifications in the Training > Notification Templates area, or click the (c.) Manage Notification Email Templates link from within the campaign creation screen. Any edits you make will be dynamic, and customized templates will be selectable once they are saved and categorized in the Notification Templates area. After you select the desired options on a notification email, click (d.) Save. If you'd like to add more notifications click +Add Notification. Click this button to save your campaign. Using the Groups feature, you can set up remedial training campaigns that will only enroll users who fail your phishing tests. This is done by setting certain options when creating your phishing campaigns. For information on setting up remedial training, click here. Use Smart Groups to automate Remedial Training. You can use Smart Groups to automate user enrollment in training campaigns based on the number of phishing test failures they've had. To learn more about remedial training with Smart Groups (Platinum/Diamond only), click here. You can edit features of any campaign in progress by clicking the drop-down to the right of that campaign. You can also cancel that campaign, which saves user completion data, clone the campaign, which allows you to copy the same settings from the previous campaign into a new campaign creation screen, or delete the campaign entirely, which deletes all data associated with that campaign. Once a campaign has started, you can monitor its progress and view the status of all users in the campaign for any and all included content. Click on the campaign name under the Campaigns tab to view the details of that campaign. Read the below information, or watch our Monitoring Training Campaigns video, to learn more about this topic. In the campaign overview screen, you can see a list of all content included in that campaign, with a completion percentage for each one underneath. You will also see a circular overall completion percentage graph (in blue). This graph shows only the percentage of users who have completed ALL of the content specified for the campaign. This button will allow you to send additional manual notifications to users, user's managers, or account admins. You can change the content of the available templates or create your own by clicking on the Manage Notification Email Templates link. 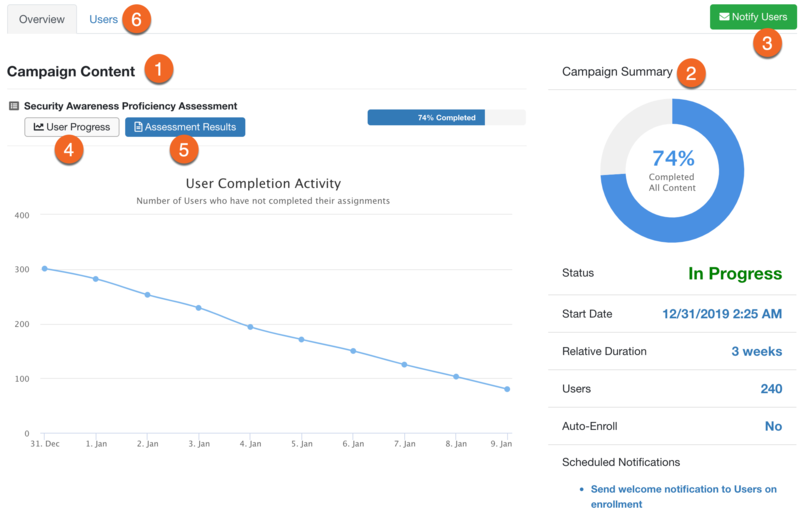 By clicking on an assignment or policy from the Campaign Overview screen, you can view details about each user’s progress on that assignment or policy. You can use the filter toggles at the top to view various breakdowns by user completion status. This area also lets you send manual notifications, manually pass users, reset the progress of users, or extend the training due date for users with a Past Due status (see here for more information). The Users tab will give you a detailed report about each user’s status for all assignments in that campaign. You can see when users were enrolled in the campaign, their current completion status, the time they’ve spent on each training assignment, the amount of time left until their due date, whether their due date has been extended, and whether or not they’ve acknowledged any course-attached policies. From the Users tab (see below), you can also send manual notifications, pass users, reset users' progress on any assignment on that campaign, extend users' due dates, print users' completion certificates, download a CSV file of user statuses, or remove users from the campaign. For more information on removing users from a training campaign, see this article. The Notification Templates section is where you can edit or create your own training campaign notification emails. We include several default email templates for you to customize or use as-is, but you can also create your own notification templates from scratch. For more information on how training notifications work, see this article. For more information on creating custom notification templates, see our Customizing Training Notifications article. The Store Purchases area will show you all the modules, games, videos, and other training content you have added from the ModStore. You can always browse the ModStore and review what other content you have access to. Beneath the Store Purchases tab, you can click any item to preview, view details for, or attach a (URL) document or policy. You can also view the duration of content, as well as hide content you do not wish to see on your list. Additionally, you can filter training content by category, to quickly find what you need. 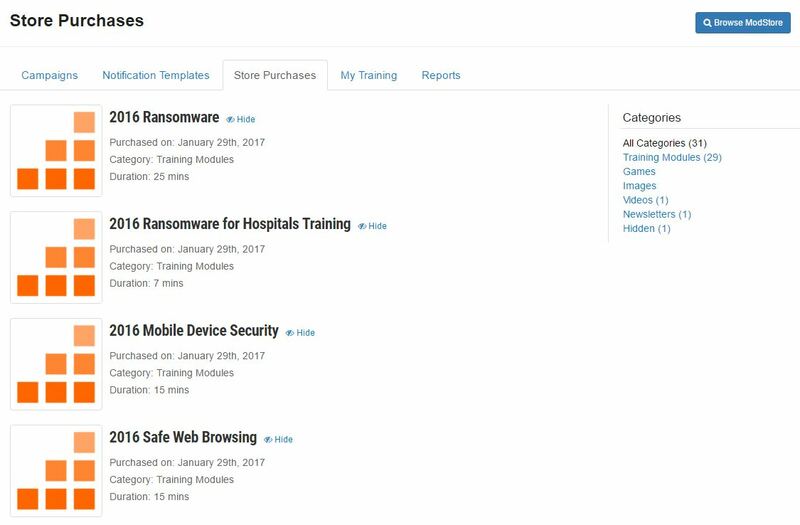 If you haven't already, be sure to add the newest Kevin Mitnick security training to your Store Purchases. Here's how to do that. If you have content that you do not plan on using in your training campaigns, you can hide it from your view by clicking the Hide icon to the right of the content title. To preview content, click the title of the content you'd like to preview while under the Store Purchases tab. On the page that follows, you'll see a Preview button, which you can click to preview the content. The preview will pop-up in a new window. Edit Module Options: Optionally, you can add a URL to a policy on any training module, video module, or game in your Store Purchases. Adding this link will prompt your users to read and acknowledge your policy after completing that particular training assignment. However, our recommended method for policy distribution and acknowledgment is to use our Policy feature. This allows you to upload PDF versions of your policies and add them as training assignments to your training campaigns. See our How to Create and Manage Policies in your KnowBe4 Console article for more information. The Policies tab is where you can upload, store, and edit your organization's policies. You'll upload policy files in a PDF format and add them to training campaigns to assign them to users and track user acceptance and/or acknowledgments. See our How to Create and Manage Policies in your KnowBe4 Console article for more information on the Policy feature. We recommend using the Policy feature to distribute policies to your users. However, if your organization's policies are hosted online, you can optionally add a URL to a policy on any training module, video module, or game in your Store Purchases. For more information, see Edit Module Options in the section above. The Learner Experience (LX) area is what your users will see when they log in to view their assignments. It will show all currently active training assignments and policies they have under any campaigns your organization is running. As an admin on your account, your assigned training will be shown under the My Training tab. You can see the training assignments or policies assigned to you, the date you were enrolled, your completion status and date, the amount of time left until your due date, as well as the time you've spent on the assignment. Use the Start button to launch the assignment in a new window. For more details about how to modify the LX, review our Learner Experience Guide. If you have training assignments or policies available in multiple languages for your users, they will be able to view their assignments in any of the available languages. See: How Do I Change the Language of Training Content?